POTSDAM — The Potsdam Snack Pack Program recently received a $1,500 donation from the InterVarsity Christian Fellowship. 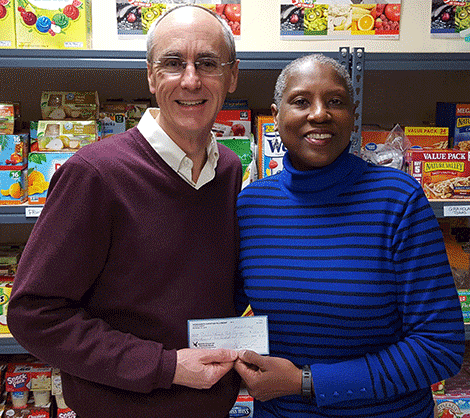 Glen Ewart, fellowship minister, is pictured above presenting a check to Laurell Brault of the snack pack program. In addition to the donation from the organization, IVCF students from SUNY Potsdam and Clarkson University worked for several weeks creating awareness about program and organizing food drives in the community. Students collected more than 2,000 individual servings of various items to fill the snack packs: fruit cups, granola bars, oatmeal, breakfast bars, pudding, applesauce, and macaroni and cheese. The Potsdam Snack Pack Program serves more than 160 students each week.